I was lucky to come across this amazing shaving cream from a tweet a few weeks ago. The post included a picture of a hand crafted luxury wooden box which was perfectly constructed for it. So within a week I had my own tin and some lucky person reading this will have one as well but I’ll talk about that later. The packaging for this cream comes in a light gauge tin with a screw on lid. 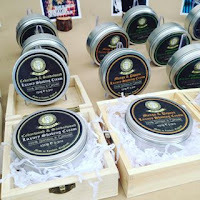 Two labels, on top with the name of the product, scent and weight and on the bottom ingredients and website information. The tin is so light that I could crush this in my hand but when shipped from London it arrived without issue. If I had to order again I would have to opt for the luxury wooden box it’s just a great presentation. The scent is a perfect 50/50 combination of cedar wood and sandalwood. When sampling the scent from the tin it’s on the light side but does increase slightly when lathering. The soap is 100% natural and organic without alcohol, parabens, sulphates or any chemical which makes it ideal for all skin types including sensitive skin. Here are the ingredients Aqua, Organic Butters (Shea & Mango), Organic Oils (Apricot Kernel, Coconut Oil & Avocado), Cedarwood & Sandalwood Essential Oils, Palm Free Vegetable Glycerin, Stearic Acid, Potassium Hydroxide, Emulsifying Wax, Potassium Oleate, Silk Peptide Protein, Sodium Hydroxide, Xanthan Gum, Phenoxyethanol and Ethylhexylglycerin. I normally use a lathering bowl but for shaving cream I opted to face lather. I placed what I thought was the correct amount of cream to generate the proper lather but I could see this was not working for me. I then dipped my brush lightly right in the tin of cream and started again. This corrected the issue instantly and produced a nice layer of rich creamy lather which offered great coverage along with incredible slickness and glide. It was some of the best I’ve ever experienced. During the shave my razor was slipping out of my hands due to my face lathering with my fingers. I had to stop the shave wash and towel off my hands to gain control again that’s how slick this cream is. This also had the best cushion and was able to go over many times with my razor correcting areas that I missed without any irritation whatsoever, truly amazing. 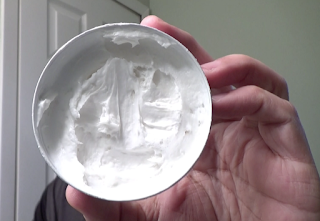 I had a great shave with Sweyn Forkbeard Luxury Shaving Cream and if your looking for exceptional cushion, slickness and glide, then this one is for you. This is a cream so its not going to lather like a soap but it will protect your face better than any shaving soap I’ve used in the past. I’m happy to announce I have one to give away. Head over to YouTube and subscribe to mychannel then post in the video “I’m in” into the comments sections I will be drawing a winner at the end of June.